Coincidentally, I found out about a book by Andrea Nguyen, The Banh Mi Handbook, which tells you everything you want to know about banh mi, including recipes for each element -- bread, pickles, cold cuts, mayonnaise, meat and sauce. Armed with this book, I set out to make a great banh mi, and the results were pretty great, even though I only made some of the elements and bought the others. 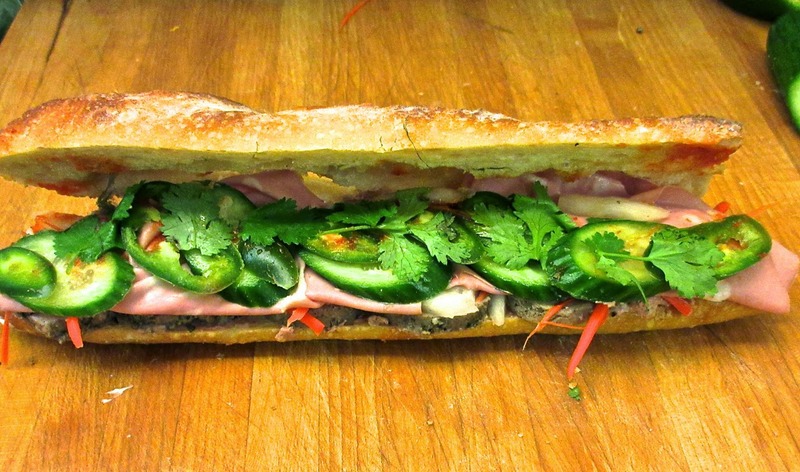 This banh mi consists (in order) of (i) a baguette from Epicerie Boulud, (ii) mayo, (iii) Maggi sauce (yes, the Vietnamese use it all the time), (iv) pork liver pâté, (v) mortadella, (vi) Nguyen's excellent poached garlic pepper pork tenderloin, (vii) her daikon and carrot pickles, (viii) cucumber slices, (ix) jalapeno slices and (x) a little sriratcha. The blending of hot, salty, sweet (the rub for the pork), sour and umami (Maggi sauce) is what Vietnamese food is all about. As is often the case, I did my experimenting while J was out of town, and so waited for her return to amp my banh mi up to the next level, substituting Nguyen's crispy roasted pork belly for the poached garlic pepper pork tenderloin. 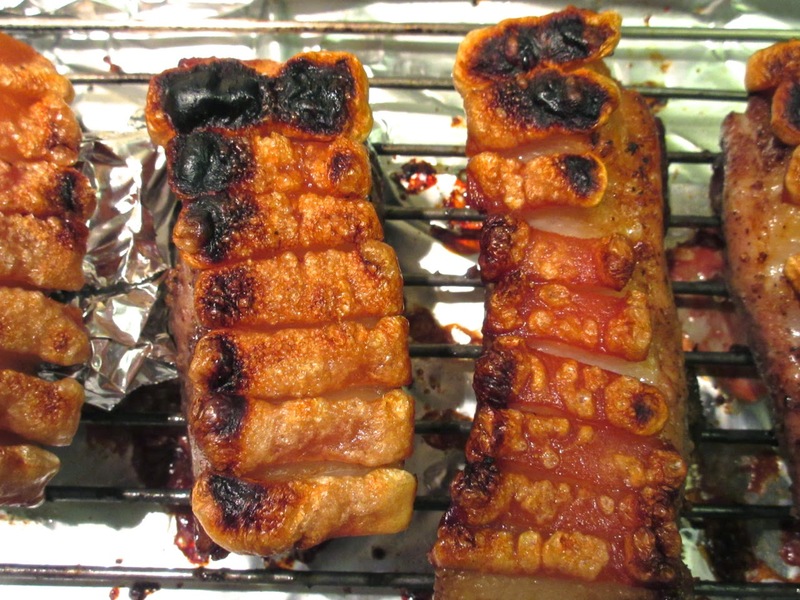 This is made with similar spices (five-spice, pepper, brown sugar, salt, soy sauce) but the richness of the pork belly, which is dried in the fridge for a couple of days before roasting and broiling, elevates the banh mi considerably. Nguyen's book contains recipes for banh mi with chicken and fish for those who don't like pork or just want a lighter version. I plan to get to some of these, as well as her banh mi rolls, in due course.